Make and receive calls with no hassle at all! This 40dB amplified corded phone gets you on the line with family and friends in a matter of seconds. Just touch the photo of the person you'd like to call and the phone will automatically dial their number. Once on a call, you'll enjoy clear reception and minimal distraction with no interference. And as an added bonus, since this phone is line powered it doesn't require AC power or batteries - and it will operate normally during a power failure. 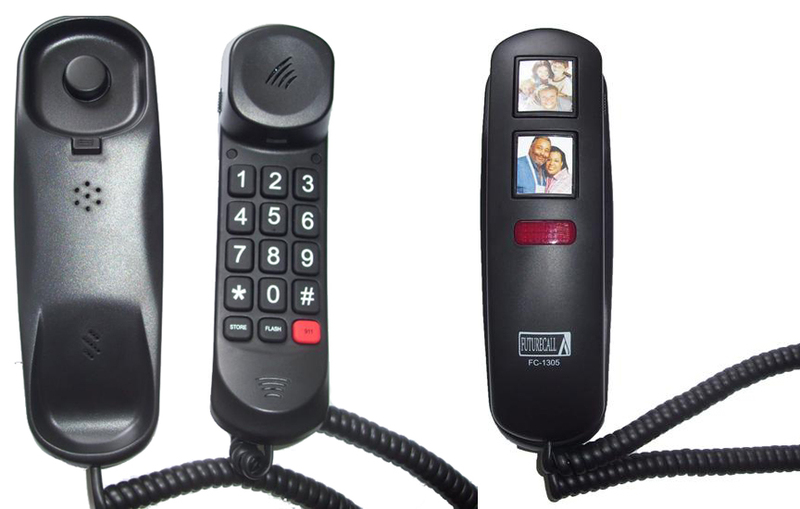 The FC-1305 Corded Phone provides a sturdy grip and features 2 Picture Memory Keys that are backed up for life using no batteries or A/C adapter. It offers up to 40db maximum handset volume and is a great wall mounted kitchen phone or desk/night stand phone for the bedroom.